Union Minister and senior BJP leader Ananth Kumar was dies at 59. Ananth Kumar was suffering from lung cancer and had returned from the US last month after treatment in New York. The minister's wife Tejaswini and two daughters were with him in his last moments. The national flag will fly at half mast across the country as a mark of respect to the union minister. Karnataka has announced a three-day state mourning and all schools, colleges and offices are closed today. Hon'ble CM Sri K.Chandrashekar Rao expressed deep condolences on the demise of Union Minister Sri Ananth Kumar. 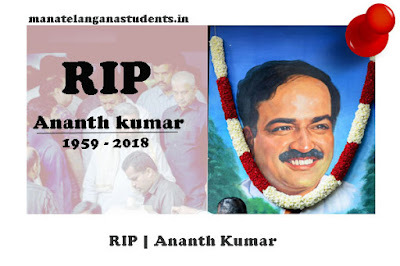 CM remembered the services rendered by Sri Anant Kumar as parliamentarian and political leader. In a message, CM conveyed deep condolences to the members of the bereaved family. Hon'ble CM Sri KCR expressed deep condolences on the demise of Union Minister Sri Ananth Kumar. CM remembered the services rendered by Sri Ananth Kumar as parliamentarian and political leader. In a message, CM conveyed deep condolences to the members of the bereaved family.